Google Instant Preview is a new feature following the September roll out of Google Instant which completes searches while they’re being typed into Google’s search field, with the goal of significantly reducing time spent searching. But is the new feature really going to speed up the searcher’s experience, or is it yet another complicated layer on what was once a simple and easy-to-understand search interface? Google’s own research revealed that on average searchers using Google Instant Preview are 5% more likely to be satisfied with the search results they click after seeing a visual preview next to the organic listing. Google Instant Preview essentially gives users the ability to see a website before they visit it. 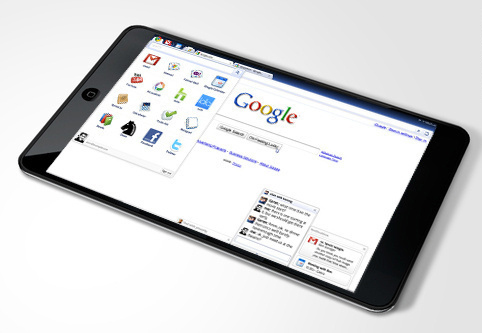 Google accomplishes this by taking a screenshot of every webpage in its index and giving users access to it via a magnifying glass icon that sits to the right of every search result. 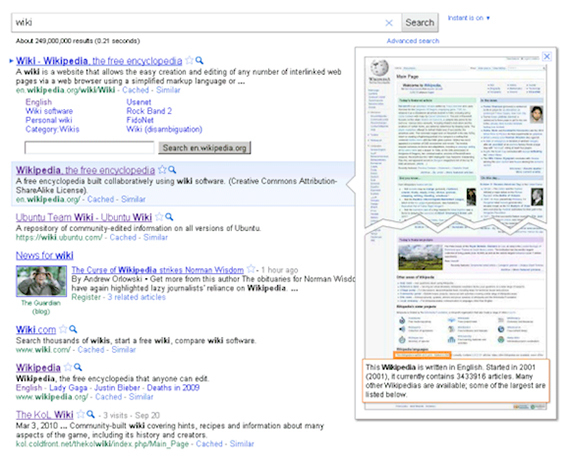 When a user clicks on the magnifying glass icon, a screenshot of the webpage in question will appear to the right of the search result listing. It’s an at-a-glance view of the website page without actually having to visit the webpage. One of the key elements to Instant Previews though is that Google sometimes highlights a section of the page where the page description occurs. This becomes a useful feature when you’re trying to find information on a specific person on a page that lists dozens or hundreds of people. Instead of having to scroll through the entire page to find the person, you can just look at the Instant Preview and see where they are on the page. Instant Previews can be helpful for many kinds of tasks. For example, say you looked at a page before and need to find it again – with a preview, you can tell if any of the results look familiar. Or perhaps you’re looking for an official website – look for a logo and formal style and you’ll probably be able to identify it. Or maybe you’re looking for a how-to guide – it’s easy to spot a page with clear illustrations and step-by-step instructions. From an SEO perspective the big question is how will Google Instant Preview affect our understanding of traditional SEO, and what changes should we consider making to webpages so that they can be easily previewed in a tiny screenshot? When a searcher performs a search and sees the search results page displayed, they do have a choice of whether or not to activate the Google Instant Preview feature by clicking on the magnifying glass icon. As we already know, Flash is not SEO friendly because it cannot be read by search engines and is even worse for Instant Preview as it shows as a black rectangle and cannot be rendered. The same is true for video files that also display a black rectangle in the preview, so consideration of this is important too. It should be pointed out that because the image size of the screenshot is so small, unless the text in headings is large enough, it will be impossible to read. So what does all this mean? Well, we have to start thinking about the overall page layout and if it looks good at postage stamp size or if it is just a blur of text with no images to make it look appealing. This means creating pages that pay more attention to navigation, titles and headers, spacing, colors and objects, such as call-to-action buttons. Having a good looking page with relevant titles now may count as much as the content on the page itself. It is likely that we will begin to see a lot more webpages with well defined graphics and other visual aids designed to get a searcher’s attention. This makes SEO even more important than ever, make sure that your images are named with keywords and their filenames and alt text are descriptive and accurate. Google Instant Preview is here to stay and designed to make the search selection process easier and according to Google faster, but in the end, good SEO practices are what is going make the difference of whether or not you get discovered on the search engine results pages. Google wasn’t satisfied with just having Instant Search, now it has introduced something called Instant Previews. Searchers and web users can now browse a large instant “preview” of a site’s content by placing the cursor over the small magnifying glass displayed beside each listing. These previews are large and Google sometimes highlights a major paragraph or quote from each displayed site. Searchers can get a general look at the layout and design of a site, on page graphics and bold headlines can usually be seen from the preview. However, small print and the general content of the page can’t be read, so searchers will have to click through to your site if they want to read your information. Assuming of course, they don’t find what they’re looking for in the headlines or bold print. Whether searchers will use this new feature remains to be seen, but these instant previews could have some ramifications on who gets the “click through” to their site. One would also reason that getting the top spot in the rankings have diminished somewhat, if searchers can quickly preview all of the top 10 listings and then make their decision. So they might not click the top listing, but decide one lower down is worth clicking. This could make any listing on the first page more worth having, not just the top one. This doesn’t really affect any of your SEO strategies and you should be optimizing for the search engines as usual. After all, getting those top rankings for your targeted keywords in the major search engines is what brings in the quality traffic to your site. In this regard, it’s business as usual. However, Google’s Instant Previews does change the whole nature of SERPs or rather Google’s search results in that webmasters and marketers have another hurdle to get past before they get that final click. Searchers might click your top number one ranking preview and decide your page is not up to standard or it’s not what they’re looking for, and can quickly try out the other listings instead. From Google’s perspective these previews could improve the “overall” quality of their results because searchers will come away happy, especially if they have not wasted their time clicking on a link, only to find it’s not what they’re looking for. Now they can easily find the right results more quickly and efficiently. On a more general note, these previews also add to the time searchers will spend on Google’s results pages. Google has been steadily focusing on this factor in recent months. Why? One good reason – the longer a searcher stays on your page the more likely they are to click your paid ads. Stands to reason, if the searcher can’t find what they’re looking for in the so-called “free organic listings” (actually, truth be told, for very lucrative keyword phrases these are not free, nor organic) they will look to the paid AdWords listings. If you check out the average time spent on Google, according to Alexa, in 2009 it was around 7 minutes and now in 2010 that average has jumped to around 14 minutes. And that’s before both Google Instant Search and Google Instant Previews are fully rolled out and implemented. One would expect that number to go much higher. While this is nowhere near Facebook’s average time of 31 minutes, Google has still doubled the time it had only a year ago. No wonder, Google can afford to give their employees that 10% raise, they have probably earned it. Nor should Google be criticized for doing all of this, they are a business and their goal is to bring in more revenue. Besides, these previews will no doubt improve the effectiveness of Google’s SERPs. Searchers can more quickly find what they’re searching for on Google and come away happy. A satisfied customer is the ultimate goal of any business, why should Google be judged any differently. These can really grab the searcher’s attention in the preview so it’s vital to have eye-popping graphics right next to your important information. Good headlines quickly capture the searcher’s attention and draws him/her to your page; just make them bold enough to be seen in Google’s previews. Place your important information in a short summary which also captures the viewer’s attention. Entice these viewers to visit your site or page. Just don’t aim all your marketing towards free organic search, but try video listings, news listings, image listings… to get other ways onto Google’s first page. This is probably not what you want to hear, but paid listings through Google Adwords is another option. Besides, for extremely lucrative keywords, as more and more major companies throw major funds into SEO and Keyword Link Buying, organic search is not really free or even available to everybody anymore. For the small-time webmaster or marketer, paid listings in Google may be your only option and that option is quickly becoming too costly for many. Businesses will now have to have a visible and physical location if they want to be listed in a local search. Google Local and Map have become a big influence on how people search and get results. We can demonstrate this by searching for ‘accountant’ and the search result returns a broad list of ‘accountants’, but perhaps too broad so we tend to search again by narrowing the result – adding a location to the search – ‘accountant in city’ and the results we see are now closer to home. So it’s no surprise that Google should be taking a closer look at how we search and attempt to refine the process and provide a more meaningful search result by changing the Google Local search algorithm to make it easier for us to find what or who we are searching for locally. Today, November 8, 2010 we see searches that reference local business and all the relevant places in that location in a new clustered visual display located in the upper right corner of a search result page. The now familiar map displays each business with red lettered pins, and links to each business. 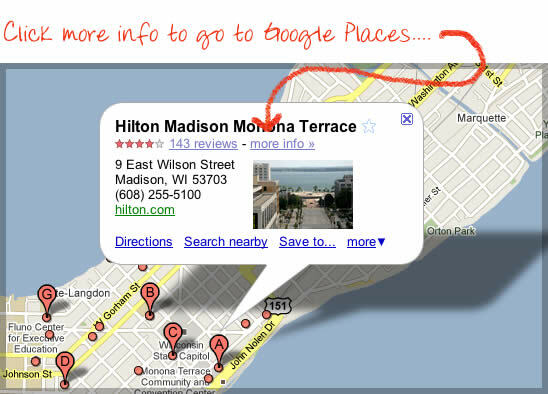 And as you scroll down the page the Google Places Map will scroll with the page so that it is always visible. In addition to the way we see businesses displayed on Google Places, a new product is being launched – Google Boost. Google Boost is a Google AdWords product that allows local businesses to feature more prominently in local searches. It allows small to medium size businesses the ability to feature more highly in searches, and concentrates much more on the relevance and location of that business than ever before. Now searchers will see sponsored location searches appear on the Google Places map as blue lettered pins and in search results with the blue marker pin next to the content description. 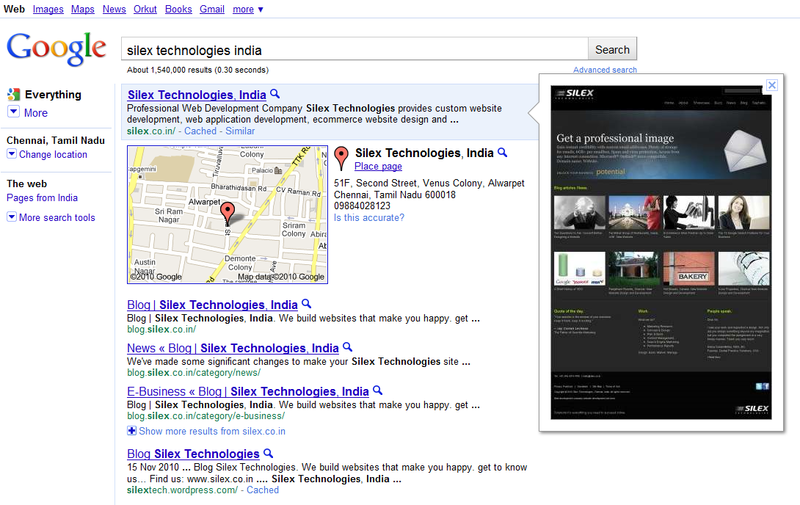 Search results for the ‘accountant in city’ will now appear first below sponsored listings and above organic listings. What this means is that results for a business in a location will now appear grouped with the other search results, making it much easier for searchers to find what they are looking for in a local area. Google reports that Place Search results will begin appearing automatically when Google determines that you are looking for a ‘business in location’ search result. 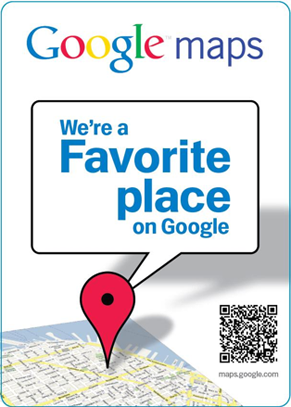 Google Places is being rolled out across the world and will be available everywhere, in 40 languages once complete. Google is hoping to provide a better, local search to users, while exploiting a different revenue stream. It’s also competing with Facebook Places which was launched a while ago. Facebook was able to use very targeted advertising to provide a similar service to its users. Google should have the advantage here though, as most Facebook advertising is passive, appearing alongside the primary content. Google’s Place Search is active and should have the advantage when it comes to conversion. Location-based services are seen as a growing market, with Facebook Places and location aware services like Foursquare enjoying significant growth since their inception. Placing Google Place Search alongside search results, Google can hedge its bets while not detracting from its standard offering. What this means is that in the long run it will be more difficult for businesses to rank at the top of a local search unless they realize that they will have to spend much more time and effort on local search engine optimization. Businesses that had previously enjoyed a prominent position on the old Google Map without a website, which was possible before, will now find it almost impossible to maintain a listing without a well developed and locally optimized website. Businesses will now have to have a visible and physical location if they want to be listed in a local search. In the past, businesses could hide their physical location and yet still be found locally through their websites, but now consumers searching for a business in a location will be able to determine if they contact that business or not based on their location. So as Google exposes competitors in searches, it is now revealing where those businesses are located – hopefully providing the consumer with more information before making a purchase decision. A low bounce rate is often cited as a hallmark of a good website – 40% or lower is typically heralded as the goal – signaling that visitors are engaged with your site and finding useful content. 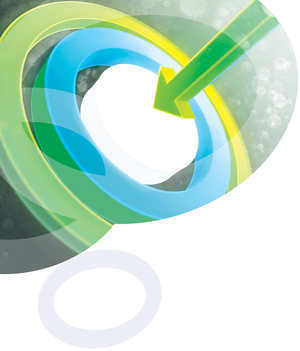 A high bounce rate is often assumed to mean that your site is not doing its job. In reality, bounce rate means different things for different sites and the emphasis you place on it will vary according to the type of site you have and its goals. When is Bounce Rate a Relevant Metric? If you have a sales or conversion process which requires the user to follow through multiple pages on your site. If exploration of your site is important to your goals. If you are trying to turn new visitors into loyal readers or customers. If yours is a retail site and you want people to shop around and make purchases. If your homepage is not inducing further clicks, particularly if it contains blog excerpts or other ‘teaser’ content. 1. Keywords and content are mismatched. In cases where visitors are coming from search engines, a high bounce rate may mean that the keywords they used and the content they found on your site are not aligned – so your site doesn’t meet their expectations in some way. Analyze your keyword traffic and make sure your pages are optimized for the keywords you want and that the content is closely aligned with keywords and not misleading in any way. 2. The next step in your conversion or goal process is not obvious or easy enough. Look at your landing pages with an objective eye and make the next step clear and easy to take. 3. The navigation on your site is confusing or unclear, making additional content hard to find. Re-evaluate the navigation and see if there are ways to streamline or simplify. Also double-check for browser compatibility – perhaps the page is not displaying correctly under some conditions. 4. Your offer or product is not presented in a compelling or easy to understand way. Look at your sales copy or offer details and see if you can refresh it or make it more appealing. You could try split-testing different versions to see which performs better. 5. Your site has technical problems. Particularly if your bounce rate suddenly spikes or displays an unusual trend, it could be an indication of technical issues – broken images or links, or something on the page not loading correctly. Check for compatibility and broken links. Test the load speed of the page and generally make sure your code is as clean and functional as possible. Check for server outages and other issues that could have temporarily affected the functionality of your site. You have a blog homepage containing all your recent posts in their entirety – Blogger blogs are notorious for this. When all your posts are presented up front there would be little reason for someone to clíck to any other pages. You have a loyal blog following and your site has a higher proportion of returning visitors than new visitors. Your followers and subscribers may just want to read the newest post and have no need to visit other pages. You are promoting a landing page which contains the call to action within it, such as submitting an email address. 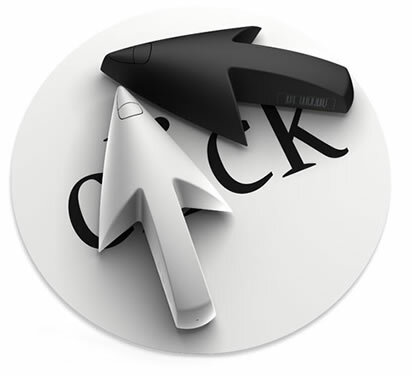 That single page can do its job effectively without requiring further clicks. The call to action or conversion takes your visitor off-site – to an external shopping cart or email sign up for example. This would look like a bounce, but can still be a conversion. Blogs typically have higher bounce rates compared to other types of sites so the same benchmarks do not apply. Bounce Rate is Not the Only Metric. Is the bounce rate higher or lower for certain keywords? Does it vary according to how people found your site? Search engines vs. social media, for example. How does it vary with New vs. Returning visitors? Which particular pages or types of content on your site have higher or lower bounce rates? Look also at length of time the visitor spends on the page which could indicate whether or not they are reading what they find – this is very important for a blog. Analyzing and inspecting your website traffic statistics can be a very helpful tool for a variety of reasons. 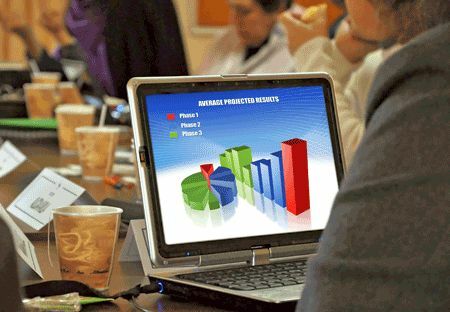 However, before you take advantage of this particular tool, you must understand how you can interpret the information. The majority of web hosting companies provides you with basic website traffic information that you simply then need to interpret and make pertinent usage of. Nevertheless, the information you obtain from your host company may be too much to handle unless you learn how to put it to use for your particular business and website. Let us begin by examining the most basic information – the average website visitors on a daily, weekly, and monthly basis. These figures would be the most precise measure of the activity of your website. At first glance, it appears that the more traffic you see that is registered, the better you are able to presume your website is performing, however it is deemed an inaccurate perception. In addition, you need to consider the behaviour of your website visitors once they come to your website in order to accurately measure the effectiveness of your site. Generally there is usually a great false impression about what is popularly known as “hits” and what is genuinely effective, quality traffic to your website. Hits only denotes the amount of information requests received by the server. If you believe about the fact that the hit can merely equate to the amount of graphics per web page, you will definitely get a solid idea of exactly how overblown the idea of hits can be. For instance, if your homepage has fifteen graphics on it, the server records this as fifteen hits, when in actuality we are referring to just one visitor looking at a single page on your website. As you can tell, hits are certainly not beneficial in analyzing your website traffic. The more visitors that come to your website, the more precise your interpretation can become. The greater the traffic is to your website, the more accurate your analysis is going to be regarding the overall trends in visitor behavior. The smaller the amount of visitors, the anomalous can more easily distort the analysis. The goal is to use the website traffic statistics to find out exactly how effectively or how badly your site is working for your visitors. A good way to know for sure is to discover the length of time on average your visitors spend on your site. In the event the time spent is pretty quick, it typically signifies an underlying problem. Then the challenge will be to find out exactly what that problem is. Maybe your keywords and phrases tend to be directing the wrong type of visitors to your website, or perhaps your graphics are perplexing or daunting, causing the visitors to leave quickly. Make use of the knowledge of the amount of time visitors are spending on your website to figure out specific problems, and as soon as you resolve those problems, continue using the time spent as a gauge of how successful your resolve has been. In addition, website traffic statistics can assist you in determining the effective and ineffective areas of your website. If you have a webpage that you consider is very important, yet visitors tend to leave it quickly, that web page requires attention. You may, for instance, take into account in improve the link to this page by making the link much more visible and enticing, or you could enhance the appearance of the actual web page or the ease that your visitors can easily gain access to the necessary information on that web page. In case, on the other hand, you observe that website visitors tend to be spending considerable time on pages that you feel are much less important, you might take into account moving some of your sales copy and marketing concentration to that particular web page. As you have seen, these statistics will certainly uncover vital information about the effectiveness of individual web pages, and visitor behavior and motivation. 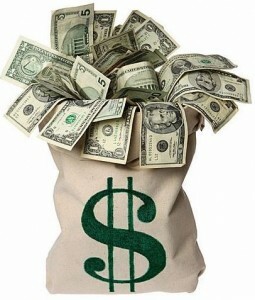 This is vital information to just about any successful Internet marketing campaign. Your website without doubt has exit web pages, for instance a final order or contact page. This is the page from which you could expect your visitor to leave quickly. However, don’t assume that all visitors to your website will find precisely what he or she is searching for, therefore statistics may show you a variety of exit pages. In the event that a substantial percentage of visitors are leaving your website on a page not created for that purpose, you have to look closely at that specific web page in order to discover exactly what the problem is. As soon as you figure out probable weak points on that web page, minimal modifications in content or graphic may have a tremendous effect on keeping visitors moving through your website as opposed to leaving at the wrong web page. Once you have analyzed your visitor statistics, you are ready to turn to your keywords and phrases. Observe if there are specific keywords that leads a specific type of visitor to your site. The more targeted the visitor – which means that they come across what they are trying to find on your site, and even better, fill out your contact form or buy something – the more beneficial that keyword is. Nevertheless, if you discover numerous visitors are now being directed – or should i point our misdirected – to your website by a specific keyword or phrase, that keyword calls for adjustment. Keywords and phrases are essential in delivering high quality visitors to your website who will be ready to do business with you. Close analysis of the keywords and phrases that your visitors are utilizing to locate your site will give you an important understanding of the needs and motivations of your visitors. Last but not least, if you see that users are discovering your website by simply typing in your company name, break open the champagne! It indicates you have attained a significant level of brand reputation, and it is a positive indication of burgeoning accomplishment. If you don’t understand why the Real Time Web is huge, you will soon. Thanks to micro-blogging sites like Twitter, a constant stream of human-posted content has infiltrated the Web. This growing infiltration has created a bottoms up approach to content creation that via the progressive support of rapidly developing applications has and will continue to empower every individual to co-create what is deemed as “important” on the Web. The Real Time Web serves as both the database that informs us of what is happening right “Now” and the human touch to the content that will compete with the traditional algorithms for what is deemed as “valuable” content to us all. We saw it with Michael Jackson’s passing. We saw it with the Iran Protests and we see it more and more everyday — the Real Time web provides us with what is happening right “Now” and with vivid detail from around the globe. “We” is driving the “Now” factor. We build websites that make you happy. get to know us. How Many Links Does It Take to Get to the Middle of Google Page One? Everyday it seems, people are asking me about the optimum number of inbound links they need to acquire for their website in order to rank well in Google. My answer is going to seem a little flip, but it is the honest, best answer. Answer: You need more inbound links – of equal or higher quality – than what your competitors have. Albert Einstein argued that any mathematical formula that required pages of calculations did not contain within it “the mind of God“. So when Albert Einstein developed E=mc2, then Einstein had fulfilled the promise of a simple formula that could encompass the brilliance of God. When people wonder how many inbound links they need to acquire to rank in the Top 4 of Google’s search results or even the Top 10 of Google’s SERPs, they are generally hoping that someone will be able to give them a numeric answer, so that they know whether they can afford to undertake the process or not. I understand the WHY of the question, but there is no canned answer that will work for everyone. Remember, your competitor may be asking the same question and undertaking the same processes as you are, trying to accomplish the same goal. You can’t truly begin to understand the answer to this question, until you have taken the time to do an Inbound Link Comparison Analysis of all of your competitors in the Top 10 spots of Google’s SERPs. • You need to look at the Top 10 listings in Google for a particular keyword. • You need to look at the quality of a few of the pages that provide links to the URLs in the search results. This is not an easy process to undertake. I have done it before, but the best you can hope for is a “snapshot” of what is out there, and therefore, what you need to accomplish. Note: If Wikipedia turns up in your search query, few people with small budgets will ever be able to dislodge Wikipedia in the search results. What they make up for in a small number of inbound links, they more than make up for with links from dozens or hundreds of PR4, PR5 and PR6 pages. Wikipedia is the king of Internal Linking, and they use that to a great degree to rank extraordinarily high in Google’s search listings. Your analysis should seek to uncover how many links a page has to it. As a general rule of thumb, Google will show you less than 1% of the existing number of links for a web page. Yahoo will sometimes show closer to 5% of the existing number of links for a web page, but they will not show you the highest quality of those links. So, as you strive to gain a “snapshot” picture of the playing field, you want to take Google’s Inbound Links number and multiply that by at least 100. Then you want to take Yahoo’s Inbound Links number and multiply that by at least 20, then cut the number in half to acknowledge the number of worthless crap links they have in their database. Once you have achieved these two numbers, then I tend to call the truth “somewhere in the middle”. With your “somewhere in the middle” number in hand, you then need to look at the quality of links to a few of those search listings, to get an idea of whether those links exist on higher quality pages or simply junk pages. If those links are on junk pages, then the goal could be achieved by just working the numbers. But if there are a lot of high PageRank pages in the mix, then whatever number is in your hand, should be multiplied, perhaps 100-fold, to overcome the quality of pages that link to your competitors. If you get the idea that my simple formula leads to a complicated answer, then you are right. All of the numbers that I have included in my sample formula are based on rough speculation, as the “snapshot” offers you your best hope of understanding the challenge in front of you. While the number of inbound links may be relatively easy to determine, the link quality is a factor that is really hard to pin down. • If you determine that you only need 300 inbound links to rank with the big boys, you may be right. • Your 300 inbound links number should also be quantified against the number of links that Google will count worthy, so you may need 1200 links to get 300 links that Google will deem worthy. This calculation depends more on the “quality of your content”, rather than the “quantity of your content”. • When all is said and done and your 300 Google-worthy links have not yet put you on page one, then you know that the quality of the links pointing at your competitors is greater than the quality of the links pointing to you. If you were hoping for an easy answer, I am sorry that I could not help you with that. Are my hopes of achieving good rankings in Google within my reach? I tend to throw “worry” to the wind and just start working. I don’t worry if I can afford to do it or not. I simply start doing, and I know that in one month, one year or five, I will have built enough value in my website that my competitors are going to be the ones who are trying to figure out if they can unseat me! Filed under E-Business, Frequently Asked Questions (FAQ), SEO - Search Engine Optimisation Tagged with Google, How Many Links, How Many Links Does It Take to Get to the Middle of Google Page One?